If you have a trapper’s soul, or if you dream of woodland, Indian summer and maple syrup or if you want to meet our distant cousins and discover their way of life then don't hesitate to contact us by email or call us on +33 (0) 3 85 40 55 50 right now to book your next river cruise in Canada. Canada is not the only area available with alpha-croisiere.com. Discover all the other destinations of river cruise that we can rent you. Rent with alpha-croisiere.com your boating holidays to enjoy one of our river and canal boats on Canadian waterways. We offer the largest selection of barges on the market. We only offer you very recent Horizon boats. They are among the best boats available for rent without a license on rivers and canals. Consult the list of all our river and canal boats available in Canada to find the most suitable for you and contact us for more information. 202km long, the Rideau Canal, Classified world heritage by UNESCO, leaves from Kingston to arrive in Ottawa. You will sail alternately in canal, river and lakes. The locks are manual but manoeuvred by lock keepers. The navigation season for river tourism begins in mid-May and ends in mid-October. Nature, open spaces and the warm welcome of Canadians are ubiquitous. The three of them largely justify you book your next cruise in Canada. There are few countries where you will be able to discover its capital by boat. So take the opportunity to visit Ottawa, Capital of Canada, almost mandatory step. 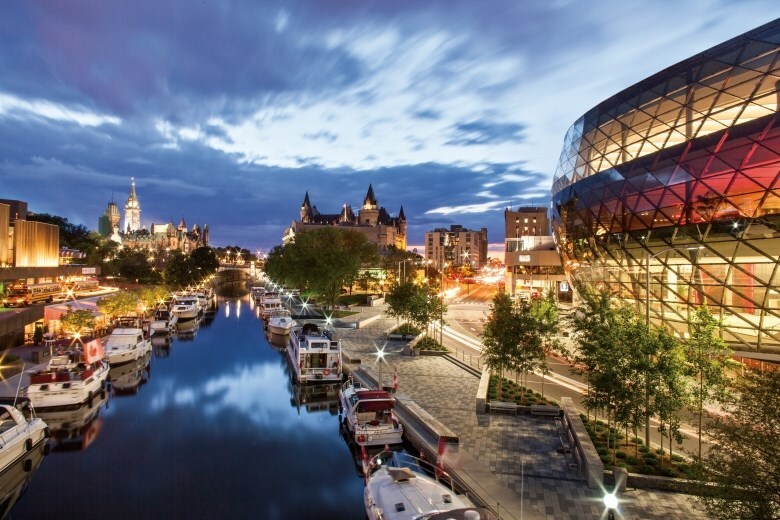 Visit the Parliament Buildings with its copper roof and the Museum of Civilization in Gatineau. With its 9 historical sites, Kingston will touch you. Its Fort Henry will delight children anr their parents. It has 35 museums, 11 nature marks, 23 remarkable sites and monuments, and a lot of places for shopping and gastronomy. A bustling city in Ontario, SmithsFalls is one of our two bases in Canada. This former railway hub will delight you. If you want to sail one way you can travel the trip from SmithsFalls to Seeley's Bay.